Gulfsream Park’s ninth race Wednesday serves as the final prep for X Y Jet before making a return trip to the Dubai Golden Shaheen (G1) March 30. It also marks the return of 2018 Kentucky Derby contender Noble Indy, who will make his first start as an older gelding. The $52,000 allowance optional claiming event is for 4-year-olds and up traveling six furlongs. Nine horses were entered, with X Y Jet the 3-5 morning line favorite. Post time is 4:41 p.m. ET. The 7-year-old gelding, trained by Jorge Navarro for Rockingham Ranch and Gelfenstein Farm, will look to rebound from his fourth-place finish in the Sunshine Millions Sprint Stakes on Jan. 19. X Y Jet dueled on the lead through quick fractions before tiring. It was his first start in seven months since winning the Smile Sprint (G3) last June. “I’m turning the page. The horse came back good,” Navarro said. “Thinking about it, to me it was a good workout for the horse that day. He came back great." X Y Jet has won 10 races from 23 starts and his earnings exceed $1.5 million. The son of Kantharos finished second in the Dubai Golden Shaheen (G1) in both 2016 and 2018. Connections are hoping to do one better next month. Jockey Emisael Jaramillo will ride X Y Jet, who drew post nine. Repole Stables’ Noble Indy is coming off an eight-month layoff and cuts back in distance here. The Todd Pletcher trainee won his first two career starts before finishing third in the Risen Star (G2) and winning the Louisiana Derby (G2). Noble Indy finished 17th in the Kentucky Derby, 10th in the Belmont Stakes and seventh in the Dwyer (G3). 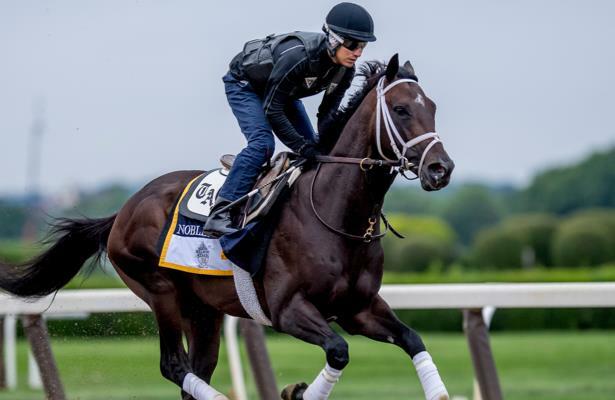 “He’s training well," Pletcher said. I think the six [furlongs] might be a tick short for him, but he’s ready to run. The goal is to get a race to set him up for something longer down the road." The Take Charge Indy 4-year-old is the co-fourth choice at 12-1. John Velazquez will be in the irons from post four. Timber Ghost is the 9-2 second choice from the barn of Jimmy Jerkens. The 4-year-old Ghostzapper colt is a Stronach Stables homebred who broke his maiden last August at Saratoga. Timber Ghost led every step of the six-furlong race, winning by 9 ½ lengths. He stretched out to seven-eighths in a Belmont Park allowance the following month and again wired the field. He last ran Nov. 21 at Aqueduct in optional claiming and finished second going 6 ½ furlongs when off the pace. Timber Ghost will be piloted by Jose Ortiz and drew post six. West Point Thoroughbreds’ Reason to Soar is no stranger to X Y Jet having run in the Sunshine Millions Sprint and Smile Sprint his last two starts. The 5-year-old Soaring Empire gelding trained by George Weaver finished fifth both times. He crossed the wire second in the Smile Sprint but was disqualified for swerving in the stretch and causing another horse to clip heels. Reason to Soar looks to return to his form from last spring, where he won three consecutive races in allowance and optional claiming at Gulfstream Park. Those races were between six and seven furlongs. Tyler Gaffalione has the mount from post eight. Rounding out the field are My Carrots (Jose Batista, post one, 20-1), Santiamen (Irad Ortiz Jr., post two, 20-1), Millionaire Runner (Fernando Salazar Becerra, post three, 30-1), Cove Blue (Robby Albarado, post five, 12-1) and His Name is Sue (Nik Juarez, post seven, 30-1).